Our black berries will be ready soon. I am going to try this recipe! There is nothing like picking wild blackberries. The anticipation of the red plump berries turning into a dark, luscious, sweet treat makes our mouths water. Wild blackberry canes growing next to our farm. 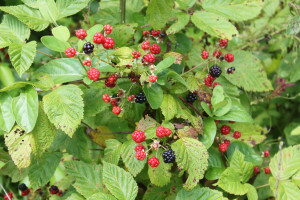 We are very fortunate to have a batch of wild blackberry plants right next to the farm. Unfortunately, it is on the edge of a wooded area and right next to an even bigger patch of poison ivy. As many of you know, I get poison ivy extremely easy. So this week, I put my protective clothing on (jeans, long sleeve shirt, boots and gloves) in the mid-summer heat to pick the ripe ones off the vine. The gloves serve a dual purpose as they also protect me from the thorns sticking out of the bush, designed to protect the delicate crop.